With each passing year, more medical students seek to enter the growing field of internal medicine. In fact, the amount of internal medicine programs and residencies have risen steadily for more than a decade. 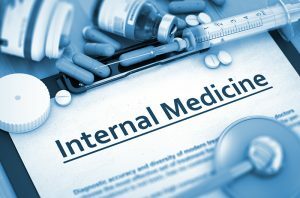 But what does “internal medicine” mean to the everyday patient? How is it defined and what are its applications? In this article, we’ll break down what internal medicine is, and describe the benefits it offers. Internal medicine is a field of practice focused on treating adults. Doctors prevent, diagnose, and treat diseases that afflict all adults, from chronically ill patients, to short-term care. Once a doctor completes an internal medicine residency, they are subsequently referred to as internist. Internists typically choose to subspecialize on one illness or one part of the body. For example, a cardiologist concentrates their focus on heart-related issues, while and endocrinologist deals with hormonal issues related to glands. An internist’s specific medical training enables them to provide precise medical guidance, which is necessary for both disease prevention and routine care. Depending on a patient’s medical condition, they may be required to see separate internists, which can be costly and time-consuming. However, the specific, focused care of all internists is something that should not be ignored by patients. After earning their bachelor’s degree, internists go to medical school for four years, then enter into a residency program that typically lasts three years. During their residency, the internists gets their medical license and becomes board certified in internal medicine. If the internist chooses to subspecialize, each specialization requires one to four years of additional training, depending on the subspecialty. During their academic studies and hands-on residencies, internists are tasked with solving difficult medical problems, thereby training them to deal with most any medical issue, especially ones they subspecialize in. Internists and family practitioners are alike in many ways. They are both primary care physicians who treat a variety of illnesses. The main difference between the two is that internists only treat adults, while family practitioners treat a broad range of issues that affect the entire family unit. An internist can become certified to treat children as well as adults, studying both internal medicine and pediatrics. This career path is called Med-Peds, short for “Combined Internal Medicine and Pediatrics.” A Med-Peds internists and a family practitioner have more in common, as they both cover the full age scale, from birth to elderly care. The precise medical training of an internist allows them to diagnose and treat patients with specific illnesses. A general internist can treat a number of various diseases, but internists with a subspecialty are highly trained to focus their efforts on complications stemming from one affliction. Internists are also trained to provide preventative care, from cancer screenings to mammograms, an internist is qualified to help patients plan their schedules and establish a regular routine. Internists are also great at communicating with each other, giving patients the full support they need. Referrals, hospital transfers and other interoffice communications are made seamless through the help of internists. Depending on an internist’s subspecialty, a patient could very well begin seeing one internist when the patient is 18, and stay with that internist for decades. This will allow the patient to develop a trusting, reliable relationship with their doctor, a connection that is invaluable. Are you looking for a medical professional in the Maryland, Washington, D.C. or Virginia area? If so, we’d love to help. From internal care to preventative care, the physicians at Comprehensive Primary Care have you covered. Contact us today to learn more about what we offer.